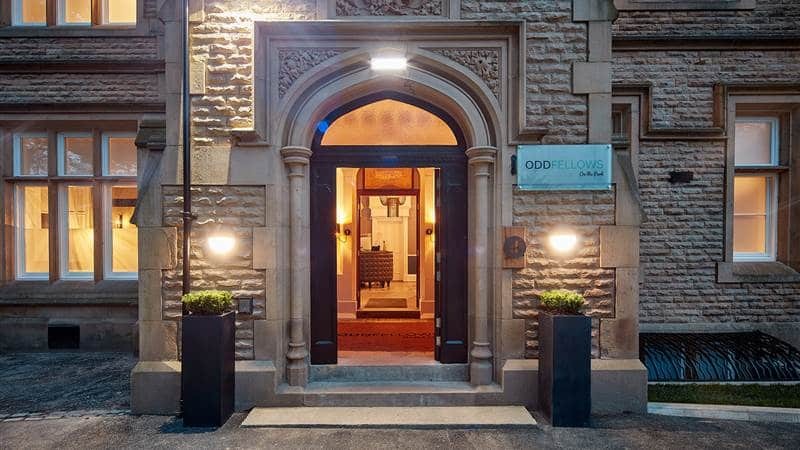 We love a stylish hotel and where better to showcase to the Cheshire PA community than Oddfellows On the Park. This 22 bedroom quirky and contemporary hotel is one of our favourites and we’ll be co-hosting a special Cheshire PA dinner on Thursday 15th March to introduce local PA’s to the event spaces at this gorgeous hotel. Perception were thrilled to be appointed as the UK Sales Representation team for Oddfellows On the Park, we act as the hotel’s on the road business development team, we’re not an event agency but simply promoting the hotel’s event spaces to our little black book of lovely event planners and PA’s. The Parlor Rooms at the hotel sit parkside with French doors leading to a beautiful terrace overlooking the glorious Bruntwood Park. These dramatic rooms are individually designed with stunning light fixtures and decor, perfect for corporate conferences and meetings for up to 60 guests. We’ll be meeting at 6pm for drinks and a showround of some of the bedrooms and meeting spaces at Oddfellows On the Park. You’ll have the opportunity to see the conference rooms, view the stunning artwork in the public areas and view a selection of bedrooms before heading through to the Galloping Major for dinner. We expect to finish around 10pm. Numbers are strictly limited so read to the bottom for how to register your interest. The Galloping Major restaurant sits within the Hall’s original ballroom. It celebrates the nickname of the ‘local legend’ of the Major who was the second owner of the hall and extended it to the grand mansion it is today. A bit of history for you – Bruntwood Park was run as a private equestrian stud and The Galloping Major was most often found astride a horse with his magnificent handlebar moustache! With regards to the delicious dishes served in the restaurant – seasonality and local produce are a huge passion for Head Chef Ian Moss. Having worked in London for many years and trained under top Michelin- starred chefs Marcus Wareing and Brett Graham, it was only when Ian moved to Northcote that he was truly inspired by British ingredients. He enjoys simplicity in his food and allowing the ingredient’s flavours to shine through. Ian is responsible for all dining experiences at the hotel from the Park Bites menu to the a’la carte offering at The Galloping Major. Menus include the best of British produce with that all important Oddfellows twist sure to delight the foodies amongst you. A current creation is his own ‘beer vinegar’ which has been influenced by Icelandic cookery, used in his sauces and fantastic on chips! So, to register for this special showcase event, contact us on hello@weareperception.com and we’ll be in touch or simply call the team on 0161 485 7238, we’d love to chat through the event spaces available at Oddfellows On the Park and help you with your next event enquiry! To find out what else we have planned for the coming months have a look here at our latest events.